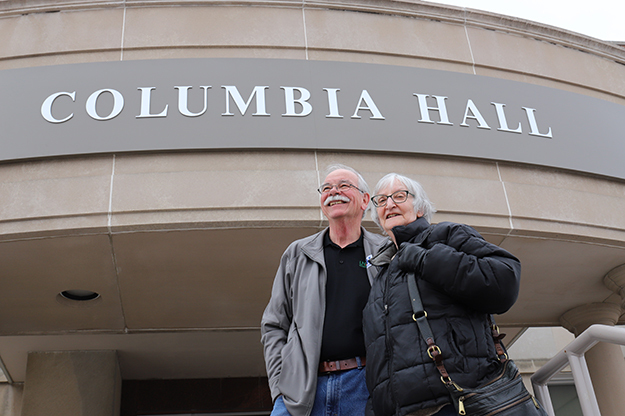 Former Grand Forks Herald editor and publisher Mike Jacobs and his wife, Suezette Bieri, a former longtime administrator at the UND Space Studies Department, stand at the front entrance of UND’s Columbia Hall, headquarters of the College of Arts & Sciences, to which the couple recently contributed $1 million in direct support to students. Photo by Connor Murphy/UND Today. 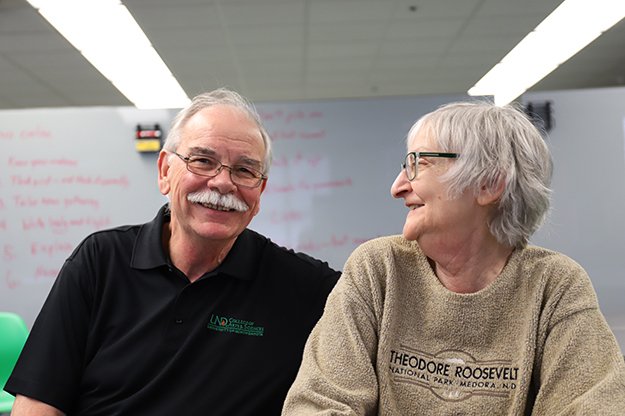 Not too long after they were married, Suezette Bieri and Mike Jacobs went to lunch with Earl Strinden, longtime leader of what is now the UND Alumni Association and Foundation. There Strinden gave them “the pitch” to give back to their alma mater. Recently, the couple made the contribution to which Strinden alluded long ago. A gift of land owned by the couple in western North Dakota will generate more than $1 million in direct support to students in the College of Arts & Sciences. 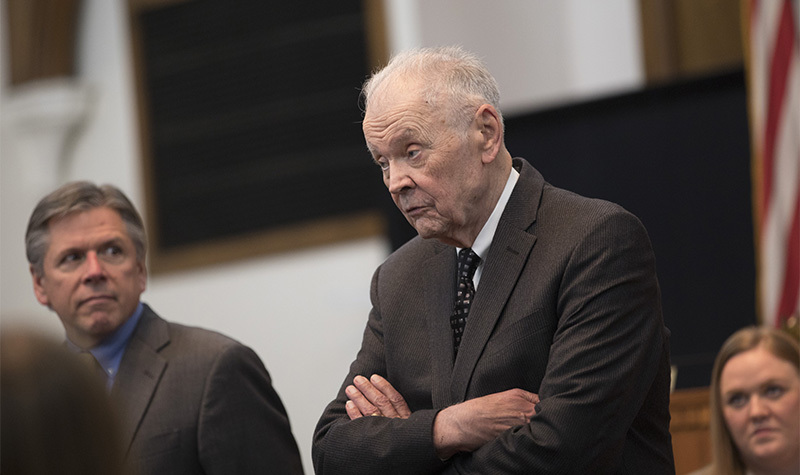 Jacobs and Bieri (right) said they only had two strings attached to their contribution to the College of Arts & Sciences: the support (1) has to go to students (2) in specified programs — all Arts & Sciences departments as well as political science, economics and geology. Photo by Connor Murphy/UND Today. Despite the amount, Jacobs – a former editor and publisher of the Grand Forks Herald – says the the contribution is quite simple. The largest portion is the $500,000 UND Undergraduate Research and Creative Activity Endowment. In saying “the programs listed,” Jacobs is referring to all departments within the College of Arts & Sciences as well as political science, economics and geology – fields he and Bieri perceive as vital to understanding North Dakota. 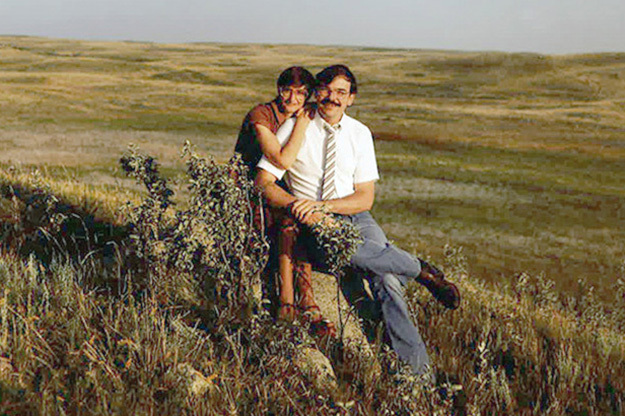 Bieri and Jacobs pose for a photo in the mid 1980s on land they owned in rural Mountrail County in western North Dakota. The couple gifted the land to UND, generating $1 million in new support for the College of Arts & Sciences. Image courtesy of Suezette Bieri and Mike Jacobs. Their inspiration for the straight-to-students approach arrives from multiple sources. Bieri, who grew up in Blaisdell, N.D., in Mountrail County in western North Dakota, graduated from UND with a bachelor’s in sociology-anthropology and a master’s in guidance counseling. 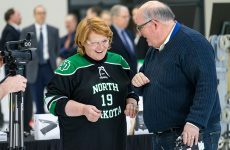 She would later return to be the deputy director of the North Dakota Space Grant Consortium, a position she would hold for more than 20 years. The statewide program provides funding for student research on behalf of NASA, and Bieri was the one who got to call students and give them the green light. She was also among the first to earn a master’s degree in space studies from the University. 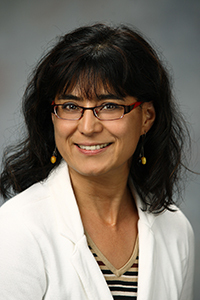 In her position, Bieri became a strong advocate for STEM (science, technology, engineering and mathematics) education in North Dakota. The couple’s large contribution to the College of Arts & Sciences also shows how much they value a strong liberal arts background. “Not only are the liberal arts necessary in keeping an informed citizenry, but they also make for more interesting people,” Bieri said. Jacobs, a native of Stanley, N.D., not far from Bieri’s hometown of Blaisdell, earned his UND degree in philosophy and religious studies. He has since maintained a near-constant connection to the college over the course of his journalism career. 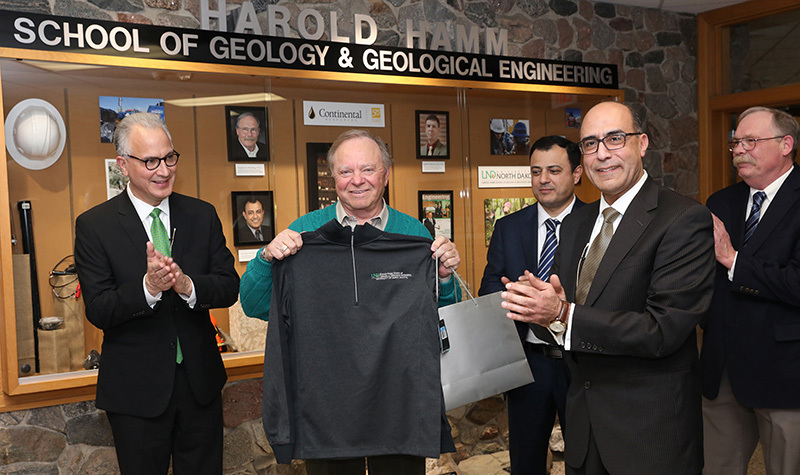 He also supports of the Geography Department’s North Dakota Online Atlas project – leading field trips across the state for undergraduate interdisciplinary research. The new endowment will allow students to come up with even more ideas for the project and beyond. “It’s really up to them to make something of it, to come up with research ventures,” Jacobs said. Funds from the endowment can also support activities pertinent to students’ educational outcomes, such as trips, tours and visits to other facilities. In addition to the $500,000 research endowment, they’ve established $250,000 as a match for other potential donors to the college, which, according to the dean, has already generated new scholarships. Additional funds have been made available for immediate use, meaning as early as this fall, Jacobs and Bieri can see the impact of their contributions. Jeff Dodson, development director for the College of Arts & Sciences, said what the couple has done for the College and its students is almost beyond words. At the UND Alumni Association and Foundation, Dodson works with donors to maximize their benefits to the College. “They have stepped up and made one of the most amazing gifts a college could ask for, and it has been so fun to watch this take shape,” Dodson said. Bieri noted how seamless the process has been with Dodson’s help. The couple also added $75,000 to their existing Pete Hale Endowment, which provides scholarships for track athletes and honors Hale, a UND All-American who was sports editor of the Dakota Student while Jacobs was editor. This gift earned a match from another alum. Jacobs and Bieri are thankful for the generosity from alums that helped them through their time in school. They now see it as their turn to make that difference. “Earl always said leave the wood pile higher than when you found it,” Bieri said, referring to Strinden’s knack for one-liners. “This is for the long-term,” she added.